While time is of course scarce, I am always interested in simple ideas for making open source documentation easier, since it has a domino effect further down on whether people feel welcome to get involved. I think visualizing projects is really important when you want to do some code spelunking — diving into large codebases you don’t know anything about. If you’re diving into a series of caves, wouldn’t it be nice to have a map? This is what I call Visual Internal Documentation, and dependency-cruiser is a great way to create and automate this! assuming the core of your code lives in the src sub folder and you have Graphviz dot installed (it comes installed in Netlify’s buildbot so no fears about that). Here you can see that index.js is the highest level file, followed by scheduler.js and reconciler.js, while swyxjs.js seems like one of those “utils” files that is imported by everybody without importing anything else (it is). Also, updateProperties.js is never used. Pretty handy for a first glance! But what does it look like for a non-trivial project? This is slightly messier, but can still be followed. 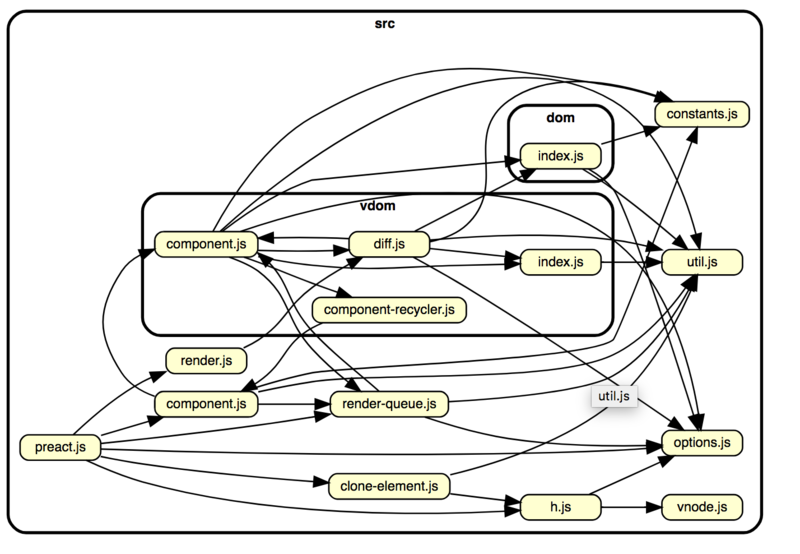 render, component, render-queue, clone-element, and h are top level imports, and vdom is an important submodule. The “terminal dependencies” like constants, util, options, and vnode also stand out as items that are frequently imported which themselves have no dependencies. That’s great! As I get into contributing to Preact I can do a breadth first scan of the top level stuff while keeping track of those files I have visited/should visit! This is valid code because src/component only wants renderComponent from src/vdom/component, while src/vdom/component-recycler only wants Component from src/component. This can be fine especially since Preact places a high priority on filesize, but you can see how this might get confusing quickly for projects of even marginally higher complexity. Isn’t that gorgeous?! But more importantly, if I am contributing to the top level files for React, I can look ahead to see where all my dependencies are in relation to what I am working on. Tweak the command line accordingly for exploring further. 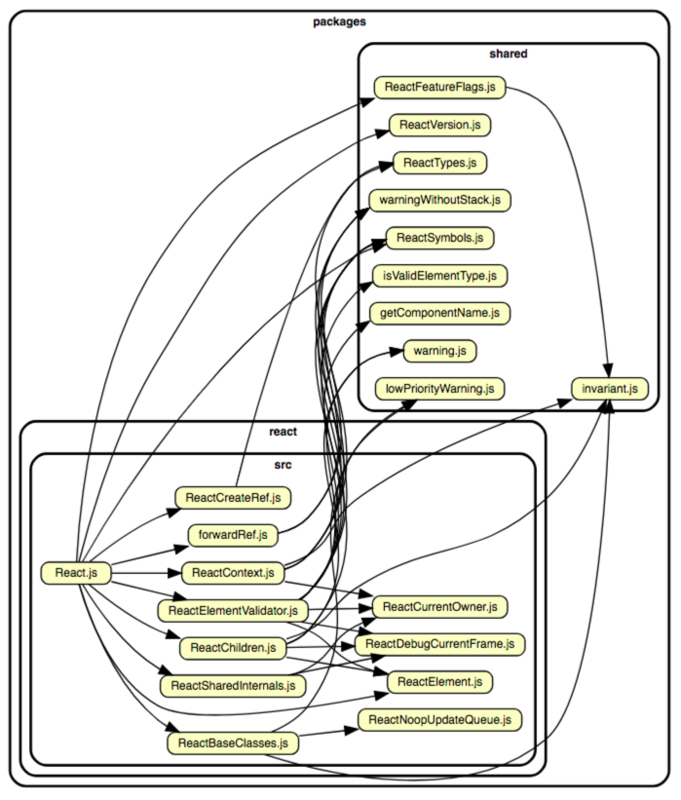 Now if you include build:deptree in your final build script, your dependency graph updates every time!!! What? Documentation that doesn’t go out of date!? Sign me up! "build:deptree": "depcruise --exclude '(node_modules|__tests__|dist)' --output-type dot ../packages | dot -T svg > static/img/dependencygraph.svg"
Here it is live deployed in the wild! I do think this is only the start of a bigger discussion around how we can promote better internal documentation for open source projects, and ironically visual documentation can be easier than keeping swathes of text up to date when code always moves faster. The svg generated has direct links to the files they represent, and it would be interesting to explore a deeper integration with docusaurus where you are able to click on any box and pull up the file right in the docs, or hover to see some top level comments. There are a ton of possibilities with Visual Internal Documentation, and I hope this has given you an idea of how to get started!